I set up a laptop on top of a bookshelf that was high enough for me to see comfortably. I also kept my regular work computer close and intentionally ran both at the same time so that I would not only have to stand, but I would have to go from computer to computer on occasion. I timed the amount of time I spent standing, and I didn’t try to torture myself. When I was uncomfortable, I sat. When I got comfortable again, I stood. Simple as that. The first day was really disappointing. After about an hour standing fairly still, the blood felt like it had all deserted my head and headed to my feet. My lower back was aching and I was ready to give up the whole experiment. After lunch I tried it again and lasted about another 30 minutes. But I woke up sore the third day. I should mention here that I’m not a total slug; I work out and I walk and I take care of myself. 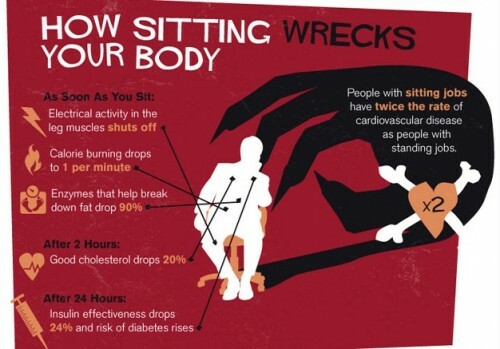 I didn’t realize that sitting was such a strong part of my day, though, and it turns out it was. I struggled to keep up to three hours on day three, because I was determined not to backslide. At that point I had to admit that sitting and taking ibuprofen wasn’t such a bad ide. The fourth day was a Friday so I really wanted to see what I was capable of because I figured I’d slide back into sitting on Monday. I did my entire pre-lunch time — five hours — on my feet and you know I didn’t feel that bad. I proceeded to plan a busy weekend so I was hoping that I could even do better on Monday. Monday, day five, well, it was Monday. I didn’t even want to stand up until I’d been at work for about two hours, so I did three hours in the morning and two hours in the afternoon. That seemed optimal, but at that point I was beginning to see the limitations of the laptop compared to my traditional blogging setup. I realized that if I were going to commit to a standing desk I would probably have to tear up my office to do it. That’s not going to happen for a little while. So I resolved to make it through the next two days at 4-5 hours a day standing. Day six was a breeze; I had it down and I did a long stretch of two hours standing with no sitting whatsoever. And then I sat, and I didn’t want to get up, but I did eventually and made it for a total of five. I did the same on the seventh day, although my specific task load that day made it a little harder. I was confident at that point I could probably continue working standing up, although I was equally confident that it would take more comfortable shoes to do it. I tracked my health statistics throughout this and I didn’t find anything really changed, which really makes me question tropes like “your good cholesterol goes down 20% as soon as you sit.” I didn’t check cholesterol but my blood pressure and heart rate weren’t terribly affected, once you discount the upward spikes that come with feeling achy. I still try to stand about 1-2 hours a day total, but I’ve come to the conclusion that blogging and in fact all office work isn’t terribly well suited to standing. I suppose if I had a large standing desk then perhaps it could be, but at least on the blogging side I give it a huge amount of concentration, so much so that I noticed my articles aren’t as good when I’m standing up… maybe it’s because the part of my brain needed for balance is taking away from the part of my brain used for blogging. 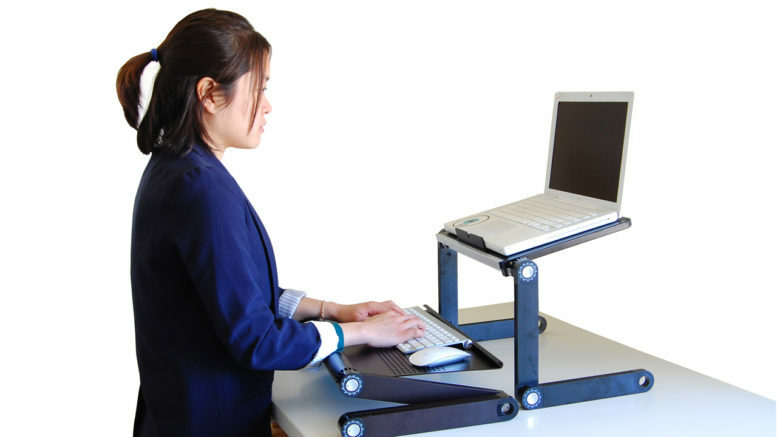 Bottom line, I don’t think standing desks are a total waste of time, and I doubt that the idea that a lot of sitting’s bad for you is a total myth either. I do think that if you can spend 1-2 hours a day standing you are much better off than if you’re in the same position for eight hours straight. I used to literally find that ten hours had passed while I was in the chair working, and now I think that I’m a lot better off making sure I stand up and move around. Can you go to jail for using your neighbors’ Wi-Fi? What is the singularity and when will it happen?